Matching with the ever-growing needs of customers, we are engaged in offering a large array of Salt Packaging Bag. The product we offer to the customers is easy to use for packing salt and used in various industries. Our offered product is highly demanded in the market for its best quality and available as per the industry standards. Moreover, customers like our product for its easy usage. With our years of experience and knowledge in this field, we are engaged in offering a wide range of Printed Salt Packing Bag. This Printed Salt Packing Cover is available with us as per the industry standards. 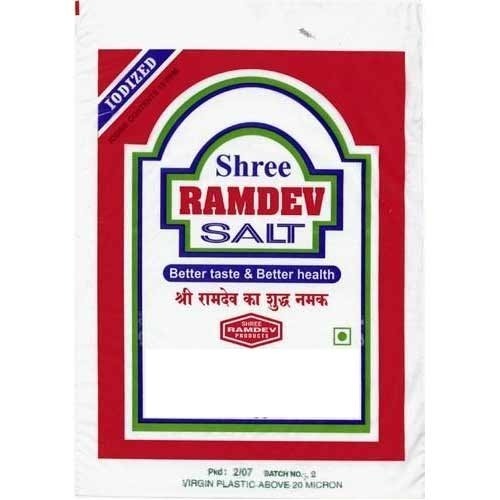 This product is used in various places for packing salt and available in different sizes. We offer product printed in various specifications to the customers on request and at industry leading prices. Keeping all the quality parameters of our company into consideration, we are engaged in offering an extensive range of Salt Packing Bag. This product is available with us as per the needs of customers and in different shapes and colors. We offer product to the customers as per their specifications on request and made from best quality material. Furthermore, the product of our company is available at industry leading prices. Backed by team of experts, we are engaged in offering an extensive range of Salt Packing Cover. The product we offer to the customers is widely recommended amongst the customers for its usage in salt and many more industries. Our product is used for packing salt and known for its high grade quality. Besides these, we offer product to the customers as per their needs and in various sizes.